While going through some old files this past weekend, a document practically jumped out at me, falling from a stack of papers and landing on the floor at my feet. It was a script for a production I put together about 15 years ago. I have only the one hardcopy left and I hadn’t looked at it in so long, I’d forgotten where it was. When I was in grad school, I had the good fortune to convince a professor to allow me to produce a play based on the Civil War as an independent project. The finished product consisted of monologues from nine different historical figures and followed their experiences over the course of the war. With the support of a splendid cast and crew who somehow had faith that this thing would come together, we managed to produce this show in one of the campus theaters. I’m still not sure how we succeeded in pulling it off. It was, without a doubt, one of the most enjoyable projects I’ve ever worked on. Putting this script together was quite a task. I must have read 30 to 40 Civil War memoirs, some well-known and some completely obscure. 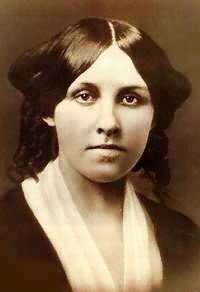 Of all the historical figures to make the final cut, I suppose my favorite was Louisa May Alcott. I think Alcott’s writing is brilliant. It is, at times, surprisingly modern in tone…practical, wry, touched with sarcasm that would fit in well in our present cynical era, but also sincere and enthusiastic at the same time. Of course, in Little Women, she crafted what is, I think, the best depiction of home-life during the Civil War, fictionalized though it may be. Even more interesting, her Hospital Sketches, published in 1863, tells of her brief experience as a Civil War nurse in Washington, D.C. Although she caught some flak from army nurses who claimed that she was glorifying her short service and insulting those who had served in the worst of circumstances for years and years. Be that as it may, the book is still superb. She had hoped to be stationed at the Armory Square Hospital, a large complex that employed the best medical standards of the day (the site of which, by the way, is now occupied by the Smithsonian Air and Space Museum and part of the National Mall). Instead, she was sent to the Union Hotel Hospital in Georgetown, then on the outskirts of Washington City. As the name would imply, it had been a hotel and tavern (many hotels in Washington were converted to hospitals). But this one had been condemned shortly before the war. It was cramped, poorly ventilated, and dirty…hardly a model hospital. Although she may sound naive in her enthusiasm, this was so typical of the period. Men and women all headed off to war with dreams of glory. The timing of her arrival is astoundingly ironic. That very day, the tragic Battle of Fredericksburg had been fought. The wounded were already headed her way. Nurse Alcott would have a very tough week ahead.